Everett and Jones BBQ (Oakland, CA) was started by Dorothy Everett in 1973 with the help of her children. Dorothy moved from the deep south to the bay area in 1952. She worked part time as a pit master until she decided to create her own business. On a hope and a prayer, Everett and Jones BBQ was born. The business has since expanded to six restaurants and includes celebrity endorsements from people like Whoopi Goldberg and John Madden. To compliment the meat that Dorothy was smoking, she developed her own sauce, Super Q. Her signature sauce comes in mild, medium and hot varieties. 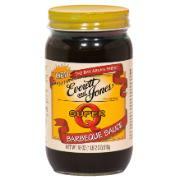 Everett and Jones was kind enough to send several jars of Super Q for review. I recently broke the seal on the first jar of Super Q (medium). The sauce is very dark and has a medium thickness. It pours smoothly like chocolate syrup. Super Q's aroma is very smokey. The liquid smoke is easily the most recognizable element in Super Q's aroma. Super Q is not for the timid. The flavors are incredibly rich, bold and smokey. It's probably the boldest, most smokey sauce that I've sampled. It was also quite spicy for a "medium" grade sauce. For those used to typical supermarket sauces, Super Q may be a bit overwhelming. Personally, I welcome the bold flavors as a nice change of pace. So far, I've tried the sauce as a dip on smoked chicken and brisket. Super Q's best use may be for pulled pork sandwhiches (with slaw). Super Q's flavor would contrast nicely with a good mayonase slaw. The sauce would also make a fine dip for fried chicken strips or nuggets. If you're looking to raise the bar on flavor and heat at your next cookout, give Super Q a try. It's not for everyone, but if you like truly bold flavors, Super Q could be just what you're looking for. Super Q can be purchased online by clicking the title of this review. 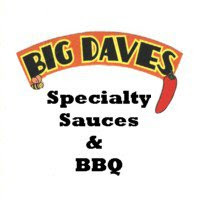 To see how Super Q compares to other BBQ sauces, check out the product reviews page. 0 Response to "Everett and Jones Super Q"